Judge Whapners (or Judges Whapner, depending on how judgy a grammarian you are). One of the many gimmicks that makes ComedySportz a delightful place to work is the way we award points in our competitive improv shows. For $3, any "loyal fan" (audience member) can purchase a pair of colored fly swatters called Judge Whapners. Once both blue and red teams have played a round of games, the judges in the audience (at $3, the cheapest judgeship one can buy) vote for the team that gave them the most enjoyment, and points are awarded accordingly. The gimmick is based in a pun that is almost as old as the show--Joseph Wapner retired from The People's Court in 1993, before many members of our audience were even born--but the conceit is so funny that we've held onto it. 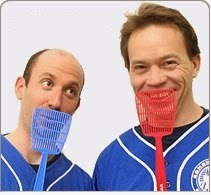 Much funnier than the pun is the idea of judging between two improv performances using fly swatters. Taste in comedy is a decidedly subjective thing. From my position at the keyboard in the sound booth, my opinion on which was the better performance is often at odds with that of the official judges in the audience, whose preference is often biased by factors having nothing to do with an objective analysis of the improvisers. Some judges really are loyal fans, CSz enthusiasts who have favorite players and will always vote for the teams they're on. Others are family and friends of particular players, and again will vote that bias every time. Generationally, some will get jokes that others do not. A Miley Cyrus reference may do nothing for a grandmother, while the frequent Five Things clue for Lincoln of giving him a stovepipe hat and shooting him in the head may kill (sorry) with the older crowd but just won't resonate with a 7-year-old. Then there are cultural differences, gender differences, religious differences, and don't forget that some people just like the color blue better than the color red, or vice versa. All of which is to say, quite simply, that taste in comedy is almost entirely a subjective thing, having little or even nothing to do with the competence of the performer. And honestly, how could it be any other way? Could and of us really embrace any set of criteria for humor that didn't have, first and foremost, "Did it make me laugh?" Even as I write this, I know that I've not always been a consistently unbiased cultural critic. It took me until I was in my mid-20s to begin listening to anything that sound even remotely like rock music, and it's only in the last decade or so that I've found a tolerance and growing appreciation for the harder, more expressionistic side of the genre. Only in the last year have I found myself opening up to hip hop and, more particularly, rap, even though this is a genre that has been around since I was in college. (It helps that I'm teaching a hip hop unit to my elementary music students.) It's not just that I didn't have much of a taste for such music; I was unapologetic in my disdain for it. For decades, I judged rock and roll to be not music, but noise. As recently as last year, I curled a lip at hearing a hip hop piece called a "song." Finding the craft, the artistry, and the passion in these and other popular genres took me far longer than others my age. My judgmentalism extended beyond the bounds of music. As a young theology student and pastor, I was a great exemplar of sophomoric criticism, the wise fool who, knowing a little more than others in the room, uses that knowledge to judge the ignorance of those others. The summer after my first year of seminary, I traveled to Louisiana to attend a college friend's wedding at a Baptist church. Looking around the sanctuary, I quickly seized on the absence of anything resembling a cross. What kind of church eschews the most essential symbol of Christianity? The kind, I decided, that seeks to downplay the crucifixion and to preach only happiness and grace. That church, and any other I encountered in subsequent years that exhibited a similar absence, had earned my theological judgment before any preacher or parishioner had uttered a single word. Similarly, the one semester liturgy course I took my second year gave me another criterion by which to judge the worship orders of every service I attended for decades to follow. I was taught that the best place for a sermon was before the offering, before Communion, before prayers, as early in the service as it could be placed, so as to downplay the importance of the preacher and enhance the importance of the community. "Best" became, in my mind, "only," even as I encountered liturgical traditions that had excellent reasons for putting the sermon later in the service, even at the end. Some of the best sermons I've ever heard were, in the centuries-old tradition of the Black church, positioned as the climax of the service. Why should the tradition of European Catholicism trump that of African-American Protestantism? Because my professor said so. I picked this topic because I read a Facebook post by that college friend about his experience of becoming an Evangelical Christian, and my first feeling on reading that post was of guilt. Looking back, I remembered how very many friends and colleagues I had looked down my proverbial nose at (not my literal nose, as that would be, beyond judgmental, rude) because of their preferences for worship order, preaching style, theological persuasion, and matters that have even more to do with personal taste than objective criteria. Who am I to insist that a sermon from one scriptural text is always better than a sermon that uses multiple passages? Or that one must never follow the creed with the doxology? Or sing "Amen" after a hymn? Or, after snuffing the altar candles at the end of the service, carry a flame out of the sanctuary, only to snuff it in the narthex? What's the point of all this judginess? It's easy to speculate on its source: we know what we like. That's true whether or not we know things about the artform we're judging. Training, knowledge, and experience just make our taste more specific. It takes a remarkable preacher to move me these days, someone who is theologically radical, intellectually stimulating, and packages those qualities in a superb, passionate delivery. Similarly, I'm looking for far more finesse in an improv performance than what used to blow me away on Whose Line Is It Anyway? And don't even get me started on music, literature, or film. My tastes are eclectic, but specific. I like performances and pieces that combine authenticity with virtuosity, and I don't always have patience for works that fall short in those areas. With all that said, I am also much more open today to the possibility that what you like has merit all its own, whether or not it can reach me. I have no inherent right to judge your taste in comedy, movies, pop music, novels, curios, house paint, perfume. You have every right to appreciate the art that brings you joy, as have I. For me, that's as far as it needs to go. Ask my why I like a particular work or performance, and I'll give you a list. Ask me what I don't like, and I'll be reticent. I might not like something that really works for you, that has meaning for you, that made a difference for you when you were going through a difficult time. Of course you care about that art. And of course it's not my place to think poorly of you for caring about it. And with that, I hang up my cultural judge robes. I'd rather live in a like and let like world.